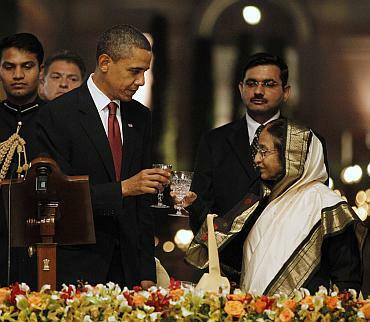 From fish tikka achari to chicken shami kebab and shahi zeera pulao, the menu at the Presidential banquet hosted in honour of United States President Barack Obama on Monday night was a gastronomical delight. 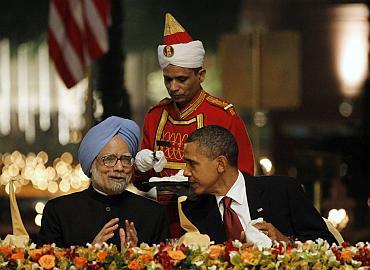 The spread for Obama and his wife Michelle was a mix of Indian vegetarian and non-vegetarian fare, as the US First Couple relished the food against the background of tunes of some popular English and Hindi songs played by the naval band. 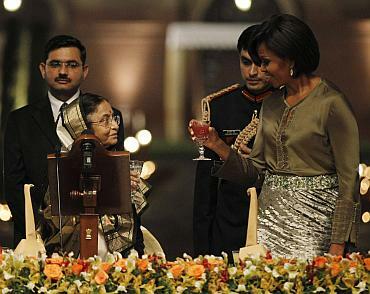 Around 180 American and Indian guests from diverse fields were present at the state dinner laid out at the sprawling lawns of Mughal Gardens at the Rashtrapati Bhavan. Some of the guests were part of Obama's entourage. Pista murg and sunehri kalia lamb were among the non-vegetarian items served while palak papri chat, bharwan parwal, mahrani hara pyaz and kyoti dal kept the vegetarian guests happy. The meal was not obviously complete without an assortment of Indian breads like rotis and naan. 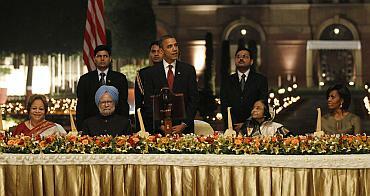 The Obamas and the other guests were free to choose between paper naan, paranthas and tawa rotis as they were treated to traditional Indian culinary delights. Also, on the table were pineapple halwa, churipayas, besides herbal tea and Indian coffee to supplement the main course. 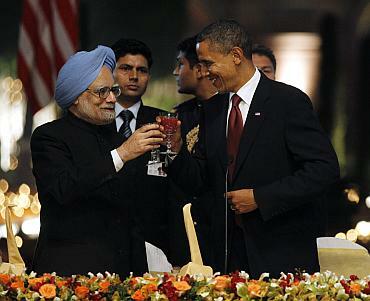 News anchor Barkha Dutt tweeted that there was an endless supply of pomergranate juice at the banquet. Former President, A P J Abdul Kalam, Chairman of the Tata Group, Ratan Tata, ICICI Bank's Chanda Kochar, Reliance Industries' Mukesh Ambani, Bajaj Auto's Rahul Bajaj and Sunil Bharti Mittal were among the guests at the dinner. 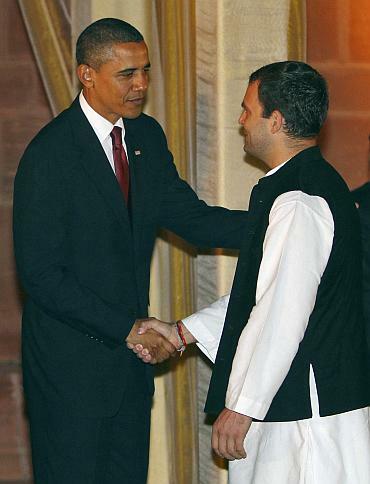 President Obama also met and spoke to Congress general secretary Rahul Gandhi, who was seated on the same table as the Obamas. Have you seen Dr Singh smile so much?